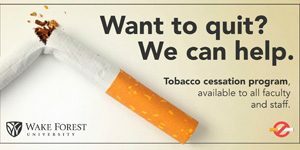 From July 19 through Sept. 6, Wake Forest will sponsor tobacco cessation classes in partnership with the Forsyth County Department of Health and American Lung Association. This free program will provide education, resources, and support for full- and part-time faculty and staff, as well as temporary employees. Faculty and staff may register for the hour-long classes, which will be held in Reynolda Hall, Room 301 on Tuesdays at 8 a.m. and Noon. Participants should consult their physician prior to beginning the classes, and they may choose to combine the program with tobacco cessation medications. Wake Forest medical plan participants have access to FDA-approved prescription tobacco cessation drugs and over-the-counter Nicotine Replacement Therapy drugs (with a prescription). Generic drugs are covered without a copayment for two 90-day supplies. Contact Human Resources at AskHR@nullwfu.edu or (336) 758-4700 for more information.